And I better brush up on my German! I'm still kind of, okay, a LOT, in shock. My hands are shaking from nerves and excitement. 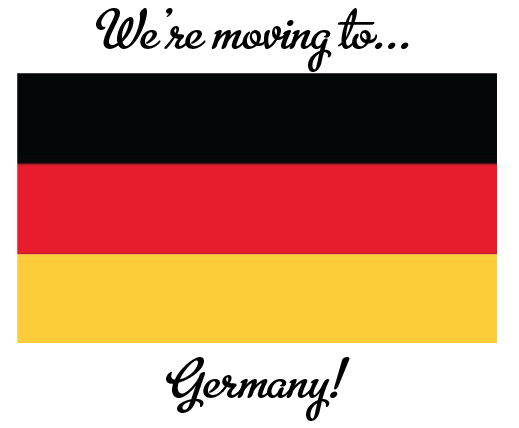 We don't know exactly where in Germany yet - we'll get official orders in the mail "on or around April 15th." There we go with the "on or around" business again! Awesome!!! You're gonna have such a great adventure there! Germany is awesome! I was born there! :) How exciting!!!!! Yay I'm so excited for you! I can't wait to see Germany through your eyes and expericence!! Congrats! I've traveled to Germany twice and unexpectedly fell in love with it! Yay! I'm excited to hear about all your new adventures. Congratulations!!! I feel so proud that I knew it was Germany with just the flag because of a YW party we had celebrating the country of Germany!!!! That is exciting!!!!! Congrats! I am so happy for your! Hopefully you can bring all of your scrappy stuff along too! :) Thanks to your husband and family as well! Congrats on the new adventure for your family, Paige!! what an amazing adventure!! Congrats! Awesome!!! I had a friend just move to Sweden and she was on House Hunter International. Not sure how she got the gig, but that would be awesome if you guys did too. Good luck with everything. Congratulations! Germany is BEAUTIFUL. I loved the time I spent there. So happy for you and your family! Can`t wait to hear, how you like it in Germany! Oh my gosh. I am excited for you, I can see why you would have a million emotions running through you. What an amazing adventure. Congratulations Paige! That is so awesome. What an adventure for you and your family. Good to have you here :).